Health- and budget-conscious consumers: it’s time for a fresh start. 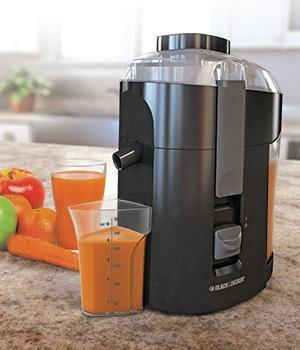 The Black & Decker Fruit and Vegetable Juice Extractor (model JE2200B) has a powerful 400-watt motor to make quick work of your favorite produce, without putting the squeeze on your wallet. Using a high quality strainer and stainless steel blades, pulp is separated out while nothing but natural juice is strained into the 300-ml pitcher below. Plus, the dishwasher-safe parts make cleanup fast and easy. With the 28-ounce pulp collector you can manage your pulp. Choose how much pulp you want in your juice and use the left overs in great recipes. Included with the juicer is a 300-milliliter pitcher to capture all the fresh-squeezed juice. It has an easy-pour spout to transfer juice into glasses or into a serving pitcher. The 400-Watt Motor is built to tackle even the toughest produce with confidence. The motor is controlled by an easy on/off switch. The juicer features a dual safety lock mechanism for additional safety and peace of mind. Removable and dishwasher safe parts and accessories make this juicer even more user-friendly. Stainless steel blades and strainer allow for easy cleanup and maintenance – just toss them in the dishwasher and you’re done.